Modern, spacious self-contained, north facing easy living apartment and garden with barbecue. Perfect for the family. Enjoy panoramic views of native bush, Waitangi river and views over the ocean to Ta Peka Point in Russell. The fully equipped kitchen has microwave, oven/hobbs, frigde/freezer and dishwasher. Bed linen is supplied, please bring your own towels. The handy local dairy and takeaway are a 2mins walk, with the supermarket 3kms away. 1km to spectacular Hararu Falls. 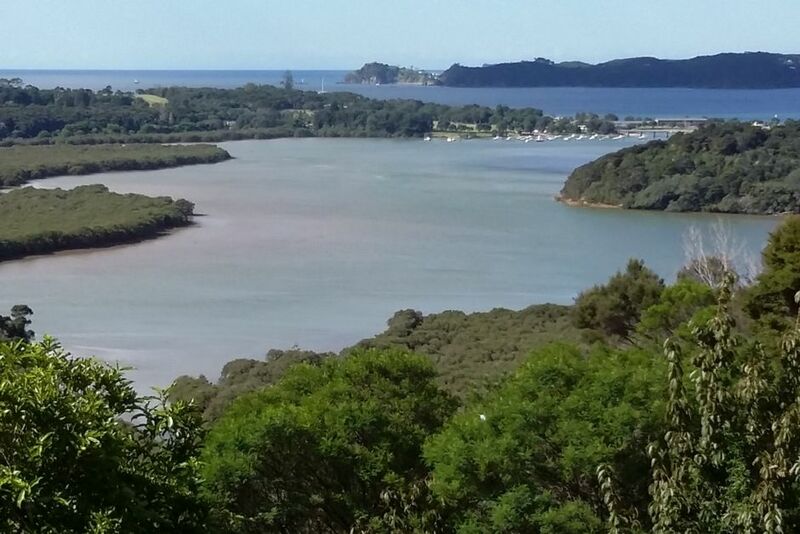 From there you can walk the 5km bush and mangrove trackwhich crosses the Waitangi river via a boardwalk, and ends close by the Waitangi Treaty Grounds Museum and Whare Waka Cafe. 3kms to great beach of Te Ti Bay with young children's playground. 4kms to resort town Paihia for more cafes, restaurants, shops, fishing/charter facilities and tourist attractions. 20kms to Kerikeri for more shops. Plenty for the whole family to enjoy! Pricing is for 4 people/per night. Please enquire about our special deals for long term stays. Please bring personal bath towel. NOTE: Under Kiwi bach tradition you are expected to: Clean the house and do the dishes before you leave, and put your rubbish in the recycling bins provided. Thank you. Tidal Waitangi river and ocean views. Some towels provided. Please bring your own Beach Towels. Indoor dining table with 6 chairs. Plus outdoor table with benches and 2 chairs, which can seat 8 people. The apartment was beautiful with an amazing view! We enjoyed the roomy place and the easy access to the owners for any questions. Everything we needed was there and the cleanliness of the place was excellent. I would recommend this location without a doubt. You even have a short walk to some beautiful falls, and a nice little trek in the woods and through some mangroves to get to the closest little town. Great views of the see and down towards Waitangi. Close to the falls, beach and mountainbike trails. Great host who was always on hand to give advice and for a chat. Would happily stay here again. A great place with a fantastic view. Polite and friendly host. Very clean and tidy. Overall a very nice holiday. The house has a magnificent view! The house has a magnificent view! Central location to all the different tourist attractions around the Bay of Islands. The view of the house is very beautiful and can't be seen on the website's introduction.It is worth recommending.